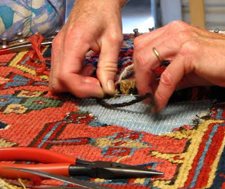 Rug pads are highly recommended to prolong the life of your handmade area rug, especially if the rug is thin and soft. 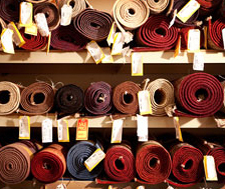 Pads under rugs will prevent sliding, and will cushion the impact between shoe sole and hard floor surfaces. Also, rug pads protect the floor, and absorb room noise. 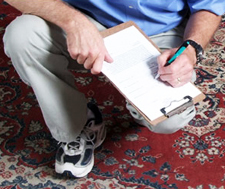 A pad should be about one inch smaller than the rug all the way around (excluding the fringes) so that the pad will not show beneath the rug. 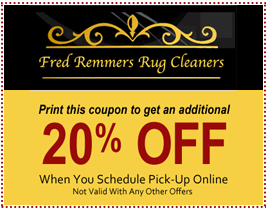 If you’d like us to custom cut a rug pad, give us a call. 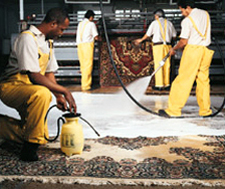 We also provide rug repair and rug cleaning services.